Malta the target, walled in to the north and south by enemy territory, and to the west by Vichy controlled Tunisia, Malta was isolated by nearly 1000 miles of sea from Gibraltar and over 800 from Alexandria, in 1941 the nearest Allied land bases enemy minefields in the Sicilian Narrows and against the island hemmed the approaches, encircling Axis air fleets in Italy, Sardinia, Sicily and Africa seemed to imprison her. The siege is still within living memory of many former members of the British and Allied armed forces who shared with the people of Malta the dangers, misery and hunger of the war, which pitted the free world against the danger of enslavement by Nazism and Fascism, because of its small size, all Malta was in the front line and there was no part that was a sure refuge from the enemy air attacks. 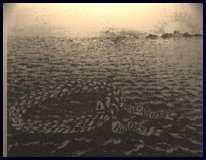 Malta and the Maltese were not new to sieges, from the dawn of history waves of conquest have swept over them or broken against their fortifications. The geographical location of Malta islands almost exactly in the middle of that vital maritime highway, the Mediterranean Sea, made them an important asset to any power striving for supremacy in the region, one dominant power after the other lorded over the Island and the Maltese learnt to live under each successive wave of conquerors, absorbing some of the imported culture and habits, but showing enough spirit and resilience to remain a distinct people with their own language and cultural heritage. Malta's position made it natural bridge between South Europe and North Africa, invaders from the north coastline needed Malta as a stepping stone, to further their ambitions in North Africa and vice versa. Ta Qali under attack, viewed from Mdina. 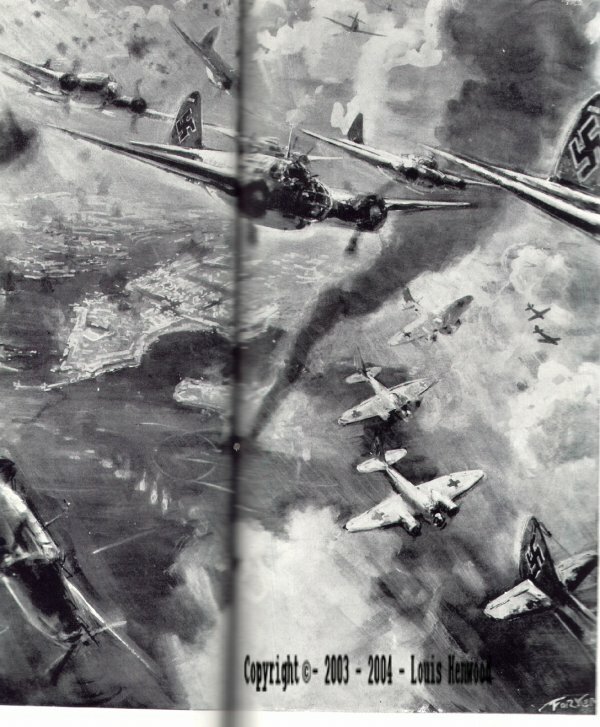 The blitz went on for some time the Germans wrath was focused on Ta Qali, at sunset on 20th March 1942, sixty Ju 88s escorted Me 110s and other night fighters approached the airfield and wave after wave dropped their bombs on the same target. Cajus Bekker, a German historian, states that stereo photographs had shown a ramp on the airfield's boundary, besides which there was a huge heap of earth and rock, leading the Germans to believe in the existence of an underground hanger, to cope with such a target a number of Ju 88s dropped 2,000- lb armour piercing rocket bombs, which could penetrate the rock up to forty five feet, incendiary bombs were also dropped on the ramp itself, in hope that the burning oil would set on fire the fighters supposedly parked inside, when the attack on Ta Qali was repeated the next morning, the Germans claimed they encountered no fighter opposition, over two hundred Germans aircraft covered the sky above Ta Qali, the bombers came from Kampfgruppen 606 and 806 from Catania, I/KG 54 from Gerbini and two Gruppen of KG 77 from Comiso, these were escorted by fighters of JG 53 and 11/JG3 (udet) and the Me 110s of 111/ZG 26, Bekker claims that this was the first time in the war that the Germans resorted to 'carpet bombing' a principle propounded in the inter war years by the Italians General Giulio Douhet, and by sunset Ta Qali looked like an erupting volcano. Wing Commander (later Group Captain) Jack Satchell, the airfield's station commander, explains, ''We encouraged the Germans into believing in the existence of an underground hanger, what happened was that we tried to cleave the rock, which caved in, on realizing the impracticability of the project, we painted half open hanger doors and put in the openings all our broken down Hurricanes and Spitfires, mocked up with pieces of wood and sacking, the Huns plastered hell out of them''. 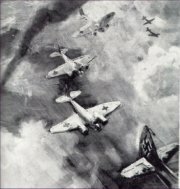 The blasting of Ta Qali reached unprecedented proportions, hundreds of armour piercing, incendiary and high explosive bombs were dropped, the airfield, and adjacent dispersal areas, littered with bomb craters, were ablaze with burning fighters, stores and equipment, in spite of this devastation, Ta Qali was again operational within a few hours, servicemen and civilians filled in the craters and removed the wreckage. 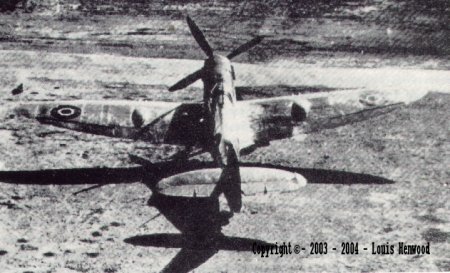 The Spitfires proved that Malta could not only defend herself but was striking back,the success of these air battles inspired enthusiasm among the population and shocked the Axis aircrew. "A Martin Maryland of 69 Squadron"
On Malta, air strips like this one provided constant targets for Luftwaffe pilots. Sunderland L 5807 shot up by two Me 109s at the camber at Kalafrana on 27th April, 1941, after having led a number of Hurricanes flown to Malta from H.M.S.Ark Royal. A Hurrican ablaze at Ta Qali, in the background is the Military Hospital at Mtarfa. Heavy anti-aircraft gun position at St.James's Battery, between the villages of Tarxien and Luqa, equipped with height and range Finder and Predictor, the former instrument supplied information for the Predictor calculations, while the Predictor forecast the likely position of the aircraft..
"Heavy Anti Aircraft Gun "
A heavy anti aircraft gun position in action,the equal jets of smoke from each gun indicate that they are firing under instrument control. Hurricanes take off at dawn to intercept enemy bombers. Scourge of Malta, and one of World War II outstanding aircraft, the Luftwaffe's versatile Ju 88. Ready for Malta,the Regia Aeronautica's Me 202s. 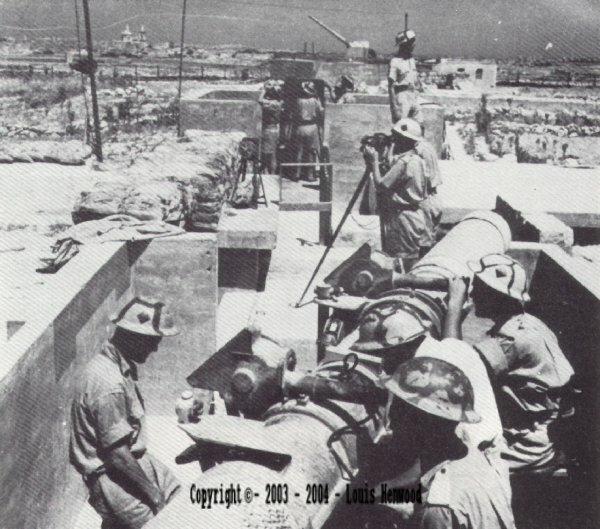 The 4.5-in HAA gun at Spinola Battery hit by bombs on 25th April, 1942. 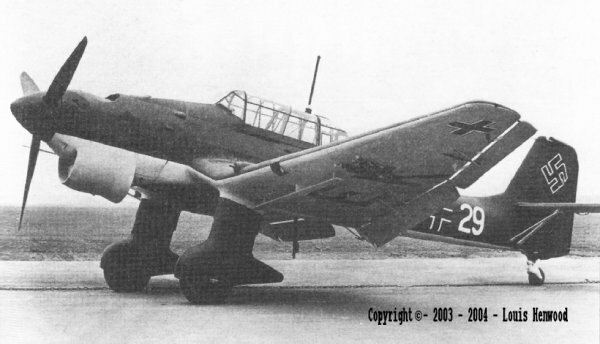 The Junkers Ju 87 'Stuka' dive bomber was a terrifying aircraft. 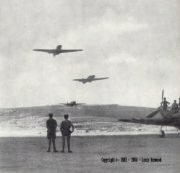 The Bristol Blenheim, based at Luqa throughout 1941, the Blenheim did sterling work at low level against the Axis shipping, but at a very great cost to themselves, casualties occasionally amounting to fifty per cent. One of the shot down German fighters. A Moment of silence, a moment alone. Our brothers have fallen, their names in stone. Faces we remember all were too young. On a day once a year, a wreath is hung. I'll forget you not though none I knew, my Flag fly's proudly for each of you, and they, who for their country die Shall fill an honoured grave, For Glory lights a Soldiers Tomb, And beauty weeps the brave .